1. 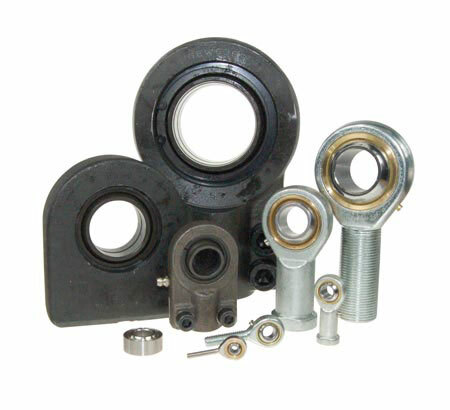 Rod Ends are compact self-aligning spherical bushings that can support a large radial load and a bi-directional axial load at the same time. 2. These bushings are classified by sliding surface types, namely, insert type, die-cast type and maintenance-free type. In the insert type, a spherical inner ring makes contact with the special copper alloy bushing with superior run-in properties. 3. In the die-cast type, a spherical inner ring makes direct contact with the bore surface of the body of special zinc die-cast alloy. 4. In the maintenance-free type, a spherical inner ring makes contact with the special PTFE liner ofmaintenance-free type. Thus, a smooth rotational and oscillatory motion can be achieved with superior anti-wear and loading properties in each type. 5. Rod Ends have either a female thread in the body or a male thread on the body, and they can be easily assembled onto machines. They are used in control and link mechanisms in machine tools, textile machines, packaging machines, etc. 6. The maintenance-free type is especially suitable for loading in one direction and is the best choice for machines in which oil must be avoided such as food processing machines, or machines which cannot be re-lubricated. We provide Spherical Plain Bearing for customers all over the world, with high quality,fast delivery and efficient service.